3-2-1 lift off! Kids can embark on an amazing 3-D tour of the solar system with this unique book filled with dazzling images, incredible facts, and 5 dynamic pop-up scenes that bring space to life. Blast off for a spectacular 3-D tour of the solar system—from the blazing surface of the sun to the deepest, darkest reaches of space. 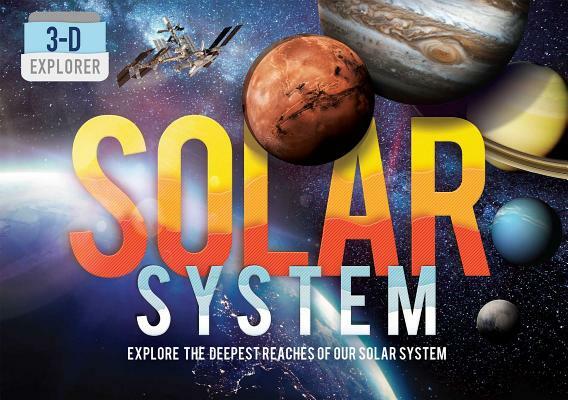 Filled with engaging text, dazzling images, and diagrams throughout, 3-D Explorer: Solar System features five out-of-this-world pop-up scenes with cool metallic effects that really bring the secrets of space to life. This refreshed title in the popular 3-D Explorer series is a kid's ultimate guide to the mysteries of space. Young astronomers will explore each of the solar system's regions in detail; discover the planets, comets, and asteroids; experience the historic Apollo 11 lunar landing; hitch a ride on the International Space Station; and even traverse the dusty red surface of Mars. No rocket or space suits are needed to embark on this educational, entertaining mission! Ian Graham is a highly experienced author having written over 180 illustrated nonfiction books and contributed many articles for magazines. After completing a degree in applied physics, he earned a postgraduate diploma in journalism at City University, London. He began work as an editor before setting up a freelance business writing and editing, including editing the magazine Space Voyager. His professional interests include, among other things, spaceflight and aviation. Ian now lives in Norfolk in the UK. Sebastian Quigley was brought up on the South Coast of England and moved to London to study industrial design. After earning his degree, he moved into the field of illustration, specializing in the airbrush and concentrating on the subjects of space and technical illustration. A few years ago, the airbrush was replaced by a computer, and now almost all his pictures are produced as renders from 3D computer modeling. He has produced innumerable images for publishers around the world on a vast range of subjects from dinosaurs to anatomy, geology to shipwrecks, but space has always remained his firm favorite. He continues to live in London with his family, and has a passion for snow and water sports.